The snowflake blanket is done (WIP here) and the first thing Livie wanted to do when she saw it was to snuggle up in it. And then she didn't want to take it off (it is a warm one), but I talked her into it so I could get a few photos of the finished product. Obviously, this blanket is in need of some blocking but I literally ran out of time. My Aunt's birthday is January 6th. 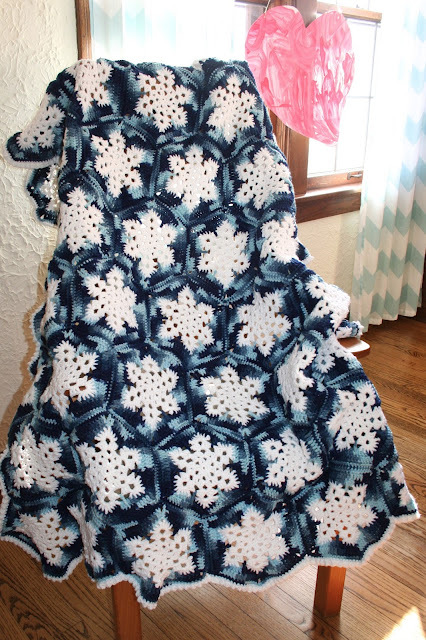 I delivered this blanket on February 15th. It was a time-consuming project, but the detail is gorgeous. I especially love the edging...simple, but it adds so much. Looks great! Must feel good to know the hours of work that caused a claw-hook hand resulted in a great blanket. Turned out so beautiful! Love the design and colors. I love this! What a great gift for your Aunt.